So your holiday promotions for Black Friday and Cyber Monday just wrapped. Now what? Well, whatever type of holiday promotions you run in your business, make sure that after the sales end you take time to note what actually happened in your business. Because holiday promotions will always happen. There will be another Black Friday next year, there will be a Fourth of July sale every summer… holiday promotions happen every year. And to run a successful business, one that is still around for more than one BF/CM (Black Friday/Cyber Monday), you need to ​scale. One of the easiest ways to do so is to track your promotions– what worked… and what didn’t work? 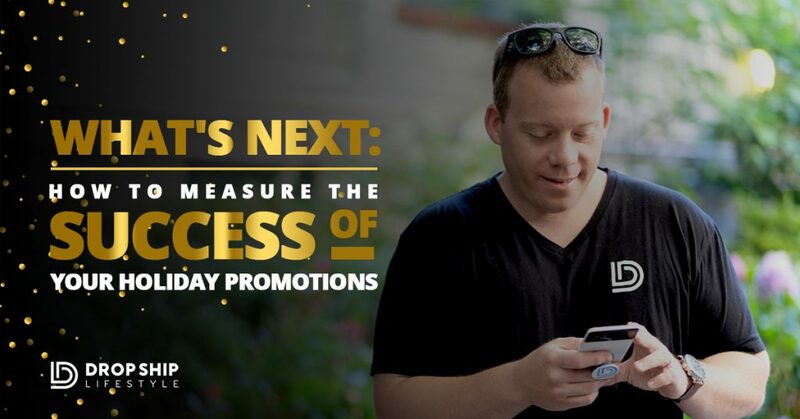 Measuring the success of your promotions will make your next one better, and the one after that even better. This topic was recently discussed in a Drop Ship Weekly video on our YouTube channel. Watch it here, and make sure to subscribe so you never miss an update! One mistake that I made in the past with my stores was not recording or tracking my holiday promotions. I was basically starting over every single year and on every single holiday promotion. I’m a slow learner here, because only after a few years of tracking my promotional campaigns, did I know which ones worked and which ones didn’t. I could then use that information to make sure that the next year's holiday promotions were even more successful. I was recording and testing data to make sure that the next year’s holiday promotions were even more successful. And I was doing that right after the promotions ended. Now we don’t send holiday promotional emails for every holiday, with every business. Just where it makes sense. Whatever holiday promotion you are running, you will want to track your efforts and the results. Here is a helpful list of holidays in 2019. These are the holidays that pretty much happen every year so you can start brainstorming some creative holiday promotions for your next campaign. Just look at this list, it’s crazy how many holidays actually exist! The possibilities are endless. It’s critical to get your top takeaways down ASAP while it’s fresh in your mind. If you try to think back to what worked last month, you’re probably going to have a clouded vision of the actual results. And it’s going to make it that much harder on you. So in your Google Drive, or wherever you store your business documents, make a new folder for all your promotional holiday campaigns. Then create a folder inside of that called CYBER MONDAY. Now, what you want to have in each of these folders is one document for every year. It doesn’t have to be some 500 page report on your holiday email campaigns. Just a simple document for numbers, thoughts, and observations. ​Grab a Google Doc template of ​the list here. Make sure to select File >> Make a Copy to have your own version to edit. Now what do we put into ​this document? Below is some of the most useful information that you're going to want to have for next year’s Cyber Monday holiday promotion. Next year, you’ll be able to open this document and see exactly what happened in 2018. This will help you make better decisions for your marketing campaigns. So the first thing to start with when tracking your holiday promotions is the Promotion Strategy. What is your offer? For the sake of this post, let’s say our Promotion Strategy was 15% off all orders over $500, plus free ‘White Glove Shipping’. The next thing that you always want to track is Website Visits (Total). In this case, it will be 24-hour period. Now out of those Website Visits, you will also want to track how many of them are Unique Visits. And then let's say out of those 5,000 visits, 4,000 of them were unique. Next is Revenue which is your sales from the holiday promotion. In this case, let’s say we had an awesome Cyber Monday and made $50,000 in revenue. After that comes Ad Spend because you definitely want to know how much you spent on ads. For this example, we’ll say we spent $5,000 in ads. Now the reason you want these numbers is because this is an easy big picture overview of your campaign. When you look back and saw that you spent $5,000 in ads to get $50,000 in revenue, well you’re not going to run the next campaign and only spend $3,000 on ads. You will want to replicate these numbers, or make them bigger. That’s why you ​need to have these as a baseline to advance from. To recap, here's the metrics you should track to gain a 'big picture' understanding of your holiday promotion. How Effective Was Your Email Marketing? Now the next important thing to track in your holiday promotions is Emails Sent because this can be a huge source of revenue for your business. You’ll want to record the details of the emails you sent such as Subject Line, Send Time, Open Rate, Click Rate, and Sales Generated. This data can all be pulled from your email marketing provider and for drop shipping stores we recommend using the Shopify App, Klaviyo. Fill out this information for each email you send. Even better is if you can link another Google Doc with the actual emails you sent. What you’re looking to do here is seeing which emails worked (had the most clicks and opens) and which one’s didn’t (​had the most unsubscribes or very little clicks). Once you fill out this data, you can easily see how each email performed. If you saw that one of your emails had drastically higher opens and clicks, then you’ll definitely want to to double down on that email next year. For the emails that don’t do so good, you’ll want to take a look and figure out why. Was it the subject line? Was it the timing? What can you change to make it better next year? The document you’re working on is where you will track it all, so you can tweak them moving forward. How Did Your Ads Perform? The next big metric to track in your holiday promotions are Facebook Broadcasts Sent. If you do anything Facebook Messenger, here’s where you would put your Ad Set, Audience Size, Open Rate, and Click Rate. Track all this data so you could see if your Facebook broadcast worked or didn’t. For example, if you sent several thousand messages but had less than 100 clicks, it’s not working and you’ll want to find out why before running your next holiday promotion. In addition to your normal Google Product Listing ads and retargeting, Ads Shown is the next metric that is super important. This would be anything that you have custom made such as a Cyber Monday graphic you’re running on social. In this area, include a screenshot of the ad and a link to the file. So next year, if it worked, you can quickly go in and edit it to use again. Along with the visual aspect of tracking your ads, you may also want to track the actual performance of the ad. This would include how many Impressions it got, how many people Clicked each ad, and how much Revenue you made. And of course, you’ll want to measure your Return on Ad Spend (ROAS). You’ll want to gather this data for each unique ad that you ran. Once you have this document and data from your holiday promotions, it’s going to be a lot easier for you in the future. Instead of last year’s promotions being a faint memory, you’ll have the details, links, and thoughts of what did and didn’t work. The data isn’t hard to get either. It’s all right there in your Shopify account, your Facebook Business Manager, or wherever you gather analytics. So first step is get all that data from the platforms that you use. Put it all into a document. ​What didn't work at all? ​Where could I have improved? ​Take a moment to list your thoughts for each question above while it’s still fresh in your mind. Did one of the emails you sent hurt your business? Did one of your Facebook ads have a much better ROAS than another? Whatever it is, the things that maybe you thought originally were ​going work but didn't, track that under What Didn’t Work. The things that did work, whether or not you thought they would, put them under What Worked. Finally, take notes on What to Focus on Next Year. That section might be one of the most important in this document. This means sitting down and taking some time to look at the data, observe the results, and gathering the most takeaways that you can. One good way to do this is to pretend you could go back in time and redo this holiday promotion. Ask yourself, “Based on my data, what would I redo to get me better results? What would make me more money? Where could I have saved money? Guess what though, you can’t go back in time. But you do have an opportunity to redo this promotion in 51 weeks because BF/CM will happen again. Taking down this data and recording your thoughts will make you prepared to have an even better holiday season than the one before. Gather and organize the data. Analyze what did and didn’t work. Apply that to next year. So as always guys, I hope you got value from this blog post. If you did, let me know in the comments below. And again, I want you to share with me if you made any money this holiday season! So let me know that as well.